KawaiiPunk - Kawaii Mascot Blog: I Believe in Migaloomagic! 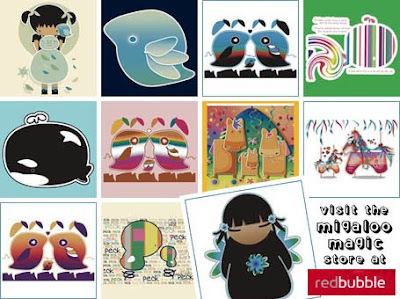 Migaloomagic is a RedBubble shop that showcases the work of Karin Taylor - an extremely talented designer, illustrator, and artist who specialises in creating joyful and wondrous art for kids and grown ups alike. Her designs are full of cute animals and characters, and are available to buy on cards, prints, and clothing. And I can guarantee that every one of them will put a smile on your face. Well, I told you this magic was powerful stuff, didn’t I? Puzzling the Puzzle Mascot! Ver2.0! Hide and Seek! Lovestruck Mascot! Thanks for the Chi Chi Memories! Elegant Hobbies and Monkey Madness! The Happy Box for Happy People!